Maine Behavioral Health Organization faces many challenges as it seeks to provide services for the future of the community. The need for private support is more important than ever. MBHO greatly appreciates and accepts gifts to its Annual Giving Campaign. This allows MBHO to continue to help those most in need of our services. Your support greatly benefits and impacts those who are less fortunate and most in need of our services. Contributions may be made by mailing contributions to our office at 49 Oak Street, Augusta, Maine 04330. You may also make a secure online donation by clicking on the button below. MBHO is a 501(c)3 tax-exempt organization. All donations are tax-deductible to the extent provided by law. Giving to MBHO helps the community. Please call us if you would like to learn more about our giving opportunities. 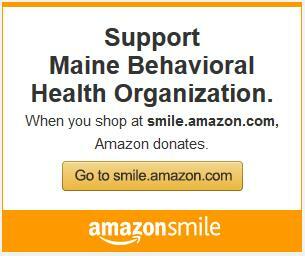 Maine Behavioral Health Organization is participating in the AmazonSmile program. Amazon will donate 0.5% of the price of your eligible AmazonSmile purchases to Maine Behavioral Health Organization. Simply click on the link below and select Maine Behavioral Health Organization as your preferred charity.